← Will Congress Fund Iron Dome Over Head Start? The New York Times performed a valuable service for its readers on Wednesday, March 13, exactly one week before President Obama is scheduled to arrive on his first-ever presidential visit to Palestine and Israel. The Times contrasted the major media voice of the liberal Zionism of the American ruling classes, with that of the voice of a champion for the Palestinian people. Which of these voices do your leaders, political, media, or religious. respond to? As President Obama prepares to fly to Tel Aviv, this would be a good time to visit, write or call those leaders and ask them. The Times paired its resident liberal Zionist columnist, Thomas Friedman (Mr. Obama Goes to Israel), with Palestinian-American Middle East scholar Rashid Khalidi (Is Any Hope Left…”? ), Obama’s University of Chicago academic colleague and good friend. In his column, Friedman reiterated liberal Zionism’s formulaic belief that the Middle East must be made over entirely in an empirical US/Israel image. After all, you have a huge interest in trying to midwife a decent West Bank Palestinian state that is modern, multireligious and pro-Western — a totally different model from the Muslim Brotherhood variants around you. Khalidi has his own abundance of “accumulated knowledge”, far more than enough to serve as a Palestinian maven for his old friend now in the White House. 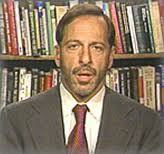 Khalidi is currently a professor of modern Arab studies at New York’s Columbia University. 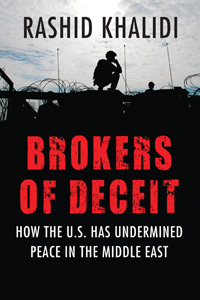 His latest book is Brokers of Deceit: How the U.S. Has Undermined Peace in the Middle East. What should Barack Obama . . . do about the Israeli-Palestinian conflict? First, he must abandon the stale conventional wisdom offered by the New York-Washington foreign-policy establishment, which clings to the crumbling remnants of a so-called peace process that, in the 34 years since the Camp David accords, has actually helped make peace less attainable than ever. It was Obama’s second de rigueur trip to Israel, both taken for mandatory political purposes. His first presidential trip will set the tone for his entire second term foreign policy. It is a far more serious journey this time because he is facing an international growing sense of outrage over Israel’s occupation, and its refusal to change course. Earlier reports from Israel indicated that the President would not travel to Ramallah. During a White House press conference call with Deputy National Security Advisor for Strategic Communications Ben Rhodes (joined on the line by US Ambassador to Israel Dan Shapiro) it was announced that the President would travel to Ramallah Thursday morning. In Ramallah, he will have a bilateral meeting with President Abbas of the Palestinian Authority. And then the two leaders will have a press conference and then they’ll have a working lunch together. Again, the United States has supported the significant institution-building that the Palestinian Authority has undertaken in the West Bank. It’s a chance to discuss our continued support for the PA, as well as to discuss ways to advance Israeli-Palestinian peace going forward. Again, this is an opportunity for the President to see firsthand some of the work that’s being done to develop institutions on the West Bank, and also to meet with a range of Palestinian young people and hear directly from them as well. So that will complete that portion of his time in Ramallah. The President will return to Israel Thursday afternoon to deliver a speech at the Jerusalem International Convention Center, followed by a dinner in his honor hosted by Israeli President Peres. Israeli officials had wanted Obama to speak to the Knesset, but Obama’s trip planner said the President preferred to address a larger audience of Israeli citizens at the Convention Center. There will be a special focus on having young Israelis at the Convention Center event. Friday’s schedule will begin with ceremonial stops at special Israeli locations, which will involve the laying of wreaths in honor of two major Israeli historical figures. Events in Israel and Palestine will conclude in Bethlehem, in the West Bank, where the President will visit the Church of the Nativity. On Friday, the President will begin his day by going to Mt. Herzl, where he will lay a wreath at both the graves of [Theodor] Herzl and [Yitzhak] Rabin, speaking, of course, to the significant contributions that both of those huge figures in Israeli history and Jewish history — to their contribution. Following those wreath-layings, he will visit Yad Vashem and tour Yad Vashem, and have a chance to lay a wreath and make remarks there, of course, marking the very somber and powerful history of the Holocaust. The President was able to travel there previously in 2008 as a senator and was very deeply moved by that experience, and it’s an important opportunity to once again mark that particular tragic element of our shared history. Both Bethlehem and the Church of the Nativity are obviously very important sights in the West Bank — important to the Palestinian people, also important to Christians in the region and around the world. And so it will be a very powerful experience for the President to be able to have the experience of touring the Church of the Nativity and observing firsthand that history and experience. Of great symbolic significance is the fact that there is no word in the schedule that would suggest a wreath being placed at the tomb of Palestinian leader Yasir Arafat, while Obama is in Ramallah. No wreath and no parallel reference to the schedule’s description of the Israeli leaders, “speaking, of course, to the significant contributions”. Note to trip-planners: There are two “sides” here, and “significant contributions” were made on both sides. If the meeting with President Abbas is in his headquarters, Obama will pass by the Arafat burial site, to his left, on his way into the building. 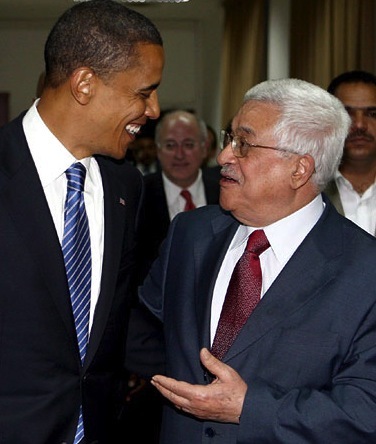 Of course, it is also possible that the Obama-Abbas meeting will be held at a different location. We will find out next week how this slighting of Arafat, in contrast to the honoring of Israeli historic figures, will be received on the Palestinian street. One thing is certain, Israel cannot hide the sight of the wall that the President will experience when he travels to Bethlehem. Indeed, the wall will be a constant part of the landscape as the President’s party moves back and forth between the West Bank and Israel. 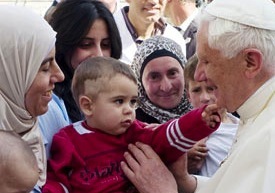 Which brings us around to the fact that the now-retired Benedict XVI made a 2009 papal visit to Bethlehem. Following the elevation of a new Catholic leader, Pope Francis, which has been much in the news, this is a good time to recall that when Benedict XVI visited Bethlehem, he was photographed standing in front of a wall with graffiti behind him, illustrating how locals feel about the the occupation wall. The Guardian’s May 13, 2009 story, should be studied by President Obama’s trip planners. Pope Benedict XVI (right) held his hands out wide to greet a crowd of applauding Palestinian refugees in the afternoon sun. Behind him stood the most striking symbol of Israel’s occupation: a paint-spattered military watchtower rising above the tall, concrete wall that presses on Bethlehem. On a balcony beneath, a Palestinian couple sat with their children, looking down as the pope waved back to them. Today the pope made his strongest call yet for a “sovereign Palestinian homeland”. He said mass in Bethlehem’s Manger Square and offered his “solidarity” to the Palestinians of Gaza, telling them he wanted to see the Israeli blockade of the coastal strip lifted. Later, he was driven in to the UN school in the Aida refugee camp on the edge of Bethlehem, home to refugees who in 1948 were forced out or fled their homes in what is now Israel. What has happened to the birthplace of the Christ child is one of the reasons Rashid Khalidi used his New York Times column to remind President Obama that his administration continues a US policy which since 1993 has failed to prevent Israel, as Khalidi puts it, “from gradually gobbling up the very land the two-state solution was to be based on”. Furthermore, Khalidi writes, the number of Israel settlers living in illegally occupied land, has steadily increased under four successive presidents, growing from 200,000 in 1993 to almost half a million today. Toward the end of his first term, Mr. Obama essentially abandoned his already modest peacemaking agenda in exchange for a lull in Prime Minister Benjamin Netanyahu’s campaign for war with Iran. Palestine was again sacrificed, this time to bribe a belligerent Israel for temporary good behavior. The American-led “process” has ultimately strengthened the Israeli far right and made Palestinian self-determination more unattainable than ever. Continuing with the Orwellian grotesquerie that is the “peace process” is contrary to any enlightened definition of American self-interest. . .
For Mr. Obama, a decision is in order. He can reconcile the United States to continuing to uphold and bankroll an unjust status quo that it helped produce. Or he can begin to chart a new course based on recognition that the United States must forthrightly oppose the occupation and the settlements and support an inalienable Palestinian right to freedom, equality and statehood. There is no middle way. It would be too much to expect President Obama to echo Ronald Reagan’s Berlin Wall speech with a passionate Bethlehem speech that would demand, “Mr. Netanyahu, tear down this wall”. But it is not too much to expect Obama to inform Benjamin Netanyahu, who has just barely assembled his new government in time for this visit, that the United States government will now change to a new course in its dealings with Israel’s occupation. Anything less would be a serious setback to the hopes of both Palestinians and peace-loving Israelis. The 2008 picture (at top) of Candidate Obama and President Abbas was taken by Omar Rashid, for the European Pressphoto Agency. The 2009 picture of Pope Benedict was taken by Peter Damman for AFP/Getty Images. It would be glaringly obvious that Obama listens to the Zionist choir. Palestinians therefore are irrelevant. A nuisance to the Israel firsters that control outright the functionings of American government. Our world is poorer for the injustice of it all. How can he not try to force the Israelis into making a just arrangement, how can he claim to me a President with moral values if he does not? What can force him to do it? Israel is a nation founded by criminal means, pushing people off their land without compensation, before any treaty had been signed, and doing it with guns, terror and violence. How can he face this injustice and continue to reward the criminals(even if they do pay our congress off ). Do they reward him too? This is one of the greatest crimes in history–there seems to be no justice left in the world. Nearly 70 years of living under an ecessively cruel occupation. And the Israelis do it blatantly because they still get how many billions a year from the U.S? Jim, Thank you for your excellent and timely review, just before President Obama hops on his “wingless” Air Farce One. I am hoping against hope that, when President Obama visits Bethlehem, he will manage to gather some courage to call out, “Mr Netanyahu, Tear Down that Wall”. In his latest article, Thomas Friedman and other Zionist Snoops of Deception, have been recently raising the volume on a “new” deceptive Israeli theme. His message: Now that the “Palestinian” struggle has been tamed and Arabs have been kept at bay because of Iran, Syria, Iraq, Egypt and Sunni-Shiite division, all Israel needs to worry about are such issues as, housing, economic issues, traffic, and the price of Palestinian Falafel and Hummos. The Palestinians no longer pose any threat and the Israelis can easily snuff out any thoughts of freedom. Friedman then benevolently “advises” the Israelis that, inspite of their asymmetrical power, it will still be gracious of them to arrive at an agreement with the Palestinians, now. In other words, now is the best time to rob the Palestinians blind, while they are still “numb” from the last pogrom in Gaza and the abandonment or distraction of their Arab kin. 1- Israel – and consequently the US – will not act, or make any meaningful decisions regarding the Two-State or One-State Solution, as long as the Palestinians continue to follow the “Peace Ritual”, as defined and dictated by Israel and enforced by the US. 2- Israeli strategy is to go through the motions of a “Peace Ritual”, in order to use the time to build more settlements, bring in more illegal settlers, expand the apartheid wall, steal more lands, and create more facts on the ground. 3- Israel and the US have only acted seriously when Palestinians reacted to occupation and tyranny through the two Uprisings, so far. The CONCLUSION that the Palestinians are bound to draw is that waging a creative, aggressive, non-violent Palestinian UPRISING.is the only way to bring attention to their cause and gain their freedom and independence.. I fear that the President will do nothing other than return proclaiming support of Israel more than ever. It is not surprising, and consistent with the behavior of a man who, rather than decline the honor in humility, accepted the Nobel Peace Prize and delivered an acceptance speech advancing the notion of a “Just War”–which in essence was a further expression of American Exceptionalism and Presidential hubris (“If America does it or the President does it, it must be legal.” Where have we heard that before? )The only humbling experience he may have is when he stoops to enter the church to descend in the candlelight to the star at the place of the manger. And Abbas will look on, hoping for change. And how many years has it been since Abu Mazen’s term of office expired? The ironies multiply, beginning with the laudable attempt of Professor Khalidi to speak once more to a friend who could not defend their friendship when he was running against Mrs. Clinton in 2008. Obama’s trip, by all indications and prior decades of sniveling genuflection and inaction, will do nothing to change the arc of this journey to hell on earth. I expect Obama to disappoint Palestinians and give the zionists whatever they want. He has done nothing up to now to even stand up for justice and equal rights, why would he start now? His itinerary is a zionist propaganda dream, and he will hardly spend any time with the oppressed Palestinians, and most of the time with their racist oppressors. I wish to be wrong, but the zionists, under Netanyahu and the rest of his anti-gentile gang, will once again, be free to continue building illegal apartheid settlements, land theft and house demolitions of non Jews, and all the other racist crimes at will. Israel is not interested in a Palestinian state, and not interested in equal rights for non Jews. It is interested in the status quo. I don’t think Obama will even say the word apartheid. Very sad, very disturbing. Obama will continue to disappoint! I expect Obama to surprise us all. He doesn’t trust Bibi anymore than we do. The EU is pressuring him to do something decisive. It’ll be interesting to notice the tone he sets as he seeks to influence Israeli public opinion. We’ll all be speculating about what’s going on behind closed doors. O God !! I have been waiting for sixty years for JUSTICE for the PALESTINIANS ! I don’t see it coming without FORCE ! Just like Israel who made ” MIGHT IS RIGHT ” fashionable, the Palestinians would have to do the same to get justice ! There is not one iota of abandonment of Palestinians by their Arab kin, rather their Arab kin have been abandoned in their effort for Palestinian liberation by their self-appointed leaders. The question: the interview was largely about Obama’s rejection of the Palestinian statehood initiative at the UN and thus rejection of international law and fora as a dispute-resolution mechanism. On the other hand, all that ended both the 32-year long Israeli occupation of south Lebanon and the re-invasion in 2006 was Hezbollah and Christian armed resistance. So, what is the place of violent vs. non-violent resistance? Where would the south Lebanese be without the former? Obama’s hands are tied. He will not deviate from his brief which permits him to call for restarting negotiations. The key word is, of course, “negotiations” in the full knowledge that they will be endless and meaningless since they will be between an oppressor (holding all the cards) and the oppressed (who are entirely at the mercy of the former), hence unlikely to produce anything remotely fair or acceptable. Also, never mind the laying of a wreath at Arafat;s tomb, Obama should instead honor the memory of the victims of Deir Yassin massacre; carried out against defenseless villagers by Zionist terrorists on April 9, 1948 – go to http://www.deiryassin.org/. This could be done when he visits Yad Vashem which is built on the grounds of Deir Yassin to obliterate any trace of the crime scene. I am a Palestinian. The whole area including the site of Yad Vashem was known to us as Deir Yassin. Tell me, do visitors to the area know that it is the site of the most barbaric massacre that bears the name Deir Yassin? The name Deir Yassin has, therefore, been obliterated. I wonder why did the Israelis choose that particular site for the holocaust memorial? The election to a second term of office gives President Obama a chance to really lead a new course in the Middle East. His visit to Ramallah makes this crystal clear. It is the strongest sign of hope yet for the Palestinians and a warning to Israel that change is coming. I have been waiting 65 years for this to happen. Powers beyond this planet seem to be working in the same direction. Let’s hope so. Thank you, Sam, for the link to Dr. Karmi’s excellent commentary. I made a comment at the site and will soon send the link to Obama as one element in a message I’m preparing to the Zionist-firewalled White House. Viva Palestine!